Angela Merkel’s right-hand man Wolfgang Schäuble has made sensational comments to one of the largest media outlets in Germany regarding the apparent Chemical Attack in Salisbury. 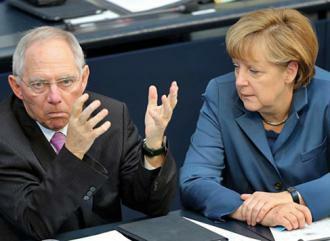 Schauble is the President of the Bundestag and was responsible for introducing the deep austerity faced by southern EU countries such as Greece. Schauble said: “In the Brexit campaign, the Britons were endlessly lied to and deceived and when they happened to be successful, the ones who did that ran away because they said they can’t take responsibility for that.” He then went on to talk about the Sergey Skripal case. Schauble said that he hoped that this would be a wake up call to the British People that after the way other EU countries have expelled diplomats like the UK did it shows that we must stay in the EU, he says that this shows "Europe Works!". Not all EU nations have expelled Russian diplomats and questions could be asked as to how Europe works if this attack was allowed to take place. The Government insists that Vladimir Putin was directly responsible for this attack but there is still no evidence to prove it. Likewise for such a tyrant as Putin those who did the attack failed miserably to do it properly as Skripal's daughter is now fine. After the attack Vince Cable and other remain politicians were quick to use this as an excuse to stay in the EU. Click here to Sign up to the campaign!